The Postcard label from Edinburgh in Scotland billed itself as the "sound of young Scotland" in 1979. They put out the third single by the Go Betweens from Brisbane, "I need two heads". Their main acts were Orange Juice and Josef K. The latter were Malcolms first band. They were ultra modern in a way that few post punk bands had the brains to be. They seemed to be closer to New York than London in their sound. They recorded one album before imploding. Malcolm subsequently played in Orange Juice and also Aztec Camera (with another Scot, Roddy Frame). In the post Orange Juice period Malcolm formed a band with his wife , Susan Buckley, called the HighBees""named after their favourite football team. the Hibs ). We met Malcolm through David McClymont (also from Orange Juice) and they both played in the final line up of the Moodists. Malcolm played on our first 4 track ep for the Fire label, "with the Coral Snakes at his stone beach" and the album, "I was the hunter and I was the prey". Malcolm then went to London University and obtained a music degree (composition , arrangement and recording). He worked as a music consultant on the movie "Backbeat" about the Hamburg days of the Beatles. He also contributed heavily to teh soundtrack ofteh movie, "CHOCOLAT". He has released two cds on the German label, "Marina". These are "Low Shot" and "Happy Boy". All the way through he played in the "Dead Dog" country music collective in South London. In 1998 he played on Barry Adamsons album, "as above, so below". In 1999 he visited Melbourne and played with Clare, Robin and Gordy at a few selected venues around Melbourne. He lives in Edinburgh and in 2009 /2010 recorded and played with the Low Miffs and the BumClocks and Stac lee, a project with former Fire Engines member, Russell Burn. In January 2015he again came to Melbourne and played at Handsome Steve Millers bar with backing from Dave Graney, Clare Moore and Stu Thomas . He also joined the Moodists for a short set. Also, while in Melbourne he caught up with former Orange Juice and Moodists member David McClymont for some recording. In 2016 he played with dave graney and the mistLY at ATP festival in Wales curated by Stewart Lee and in selected dates in Brittany and the UK. Clare and I met Louis at a crappy job we had to do to get by living in London. He was playing in a South London collective called the Hackney 50. He sang and played piano. This band was rough as hell and proud of it. Louis began playing with us in 1987. A brilliantly instinctive feel for music. He brought the crudest set of chords to life. He sat hunched over the piano, cigarette drooping at the corner of his his mouth, hat at a rakish angle and his suit looking like he'd slept in it for a week. Louis was the real thing, he lived a real rough , devil may care life and did it all while playing the greatest piano around. How he got around London with a piano and an amp and a cigarette always burning in his mouth and no car is beyond me. He also played in a jazz outfit formed by Terry Edwards and "Bedders" from Madness called the Butterfield 8. He played with former Tactics lead singer, Dave Studdert in his band "Mumbo Jumbo" , touring Australia with them in 1995. Occasionally he plays in "the Nutty Boys". He has put out a series of videos instructing people how to play "Boogie Woogie" style. He teaches pre teens how to do so in London with his "play Boogie Woogie" in one lesson technique. He is always, always on the go. A gem. He lives and works in Camden and plays in the Lee Thompson Ska Orchestra as well as his own solo shows and recordings. Conway was an old friend from before we had left Australia. Previously he had played in the Feral Dinosaurs, Dust on the Bible and The Boy Kings with Dave Last. Conway loved country music. He was totally into the mythology and into making that a reality. A brilliant songwriter and performer. Like Louis and Robin he was seriously into being a musician, practising constantly and never thinking of doing anything else. The Boy Kings were at their peak in 1988/89, a fantastic live act. Like a rockabilly ac/dc with the band all looking like they rode with Billy the Kid. A great pity they never recorded. Conway brought a great arrangement of "the Streets of Laredo" to The White Buffaloes. 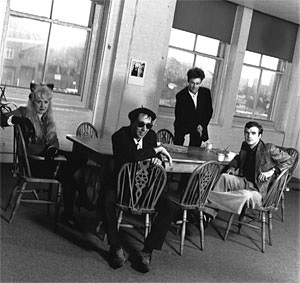 We played for about a year and then Conway got a call to join Nick Cave and the Bad Seeds at the beginning of 1990. He has been with them ever since. He released a four track ep on the Torn and Frayed label in 1992 and one album, a collaboration with Suzie Higgie (formerly of the Falling Joys) in 1998. This was released on the Anchor and Hope label which is run by the Dirty Three.A further cd, " Nothing Broken" was released in 2000 on his own label "beheaded". Conway supported this via dates in Europe with the Dirty Three and on his own in Australia. Conway still performs and records as of 2009 with the Bad Seeds and also with the brilliant trio he has gotten together with Amanda Fox and Robert Tickner. 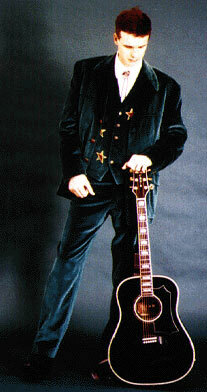 Marty was a brilliant young guitar player who played pedal steel as a hobby. He played on the album, My life on the plains. Graham began playing with us after Marty went off to do his own thing. Graham was playing with Marco Halstead in the Paradise Vendors at the time. Previously he had toured the world recording and playing with the Triffids. He plays with many people around Melbourne, has worked as a producer and runs the W Minc label with Steve Miller. Andrew played bass with us when Gordy Blair went back to the UK for a period of eighteen months. We always expected Gordy to come back. Andrew played at a time when things were very down and we were waiting for "I was the Hunter..." and "Lure of the tropics" to come out. This took about a year. Due to working commitments he was unable to travel much so the rest of us (Myself,Rod,Clare and Robin) did what we called the "SoftÕnÕsexy shows" around Melbourne and Sydney. Andrew was a great player and a very warm personality to play in a band with. Very laid back and happy to be playing. During this time he also did a lot of shows with Robin,Clare,Amanda Brotchie and Rod as "the Vanishing Lady". This was a band doing all of Robins material. He played on about five songs on the Ònight of the wolverine cd. Previously he had played in the Pete Best Beatles,the Metronomes,the Sacred Cowboys and the Pop Gun Men. Chris had played with Clare and I in the Moodists. He had a very distinctive sound in those days. A fretless bass and a metal plectrum. A childhood friend and peer of the late,great Tracy Pew. They shared many traits and charms. Among these were cowboy hats,tattoos,leather pants,cigars and a taste for wine,beer and whisky. Literature was as big an interest as music and the bass had to be simple and central to the sound. When we came back to Australia in 1988,after living in the UK for the better part of five years,Chris was among the first people we looked up. (He had left the Moodists to come back to Australia in late 1985). He was busy with his own band ,the Great Temptation,but was up for doing the White Buffaloes as a side trip. We did all the songs from the "at his stone beach "ep as well as covers of songs by Fred Neil,Gram Parsons,the Charlatans(the original San Francisco mob),the Sir Douglas Quintet and Gene Clarke.